Shadow's third boss in Sonic the Hedgehog (2006), Mephiles Phase 1 comes consecutively after Iblis Phase 2, and is the only boss in the game other than Solaris where control switches between characters. Having defeated the fire-beast Iblis with Sonic, Tails, Knuckles, and Rouge, Shadow is just about to follow them through the Chaos Control time portal back to Soleanna when he spots Mephiles the Dark - the shadowy doppelganger responsible for sending him to the future in the first place. Before the battle, Mephiles reveals that in this timeline, after the Day of Disaster humans hunted Shadow down and imprisoned him. The demigod attempts to enlist Shadow to his cause, to "Punish this foolish world of humanity" - which Shadow declines in no uncertain terms. Mephiles reacts by transforming into a kind of crystalline form, and attacks. 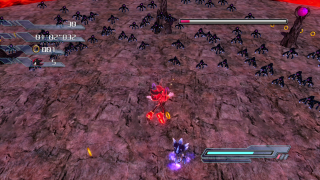 The boss fight starts with Shadow being swarmed by hundreds of floating, replicating mini-shades. Mephiles himself is utterly untouchable, hiding in Shadow's own shadow. Precisely what you're supposed to do in this section of the boss is not entirely obvious, and Mephiles' admonishment of "It doesn't matter how many of them you defeat, you know" does nothing to help matters. In fact, the spirit is lying; Shadow must smash through a great number of the mini-shades until his Chaos Boost meter is charged. Activating it will boot Mephiles out of his shadow, and leave him open to Homing Attacks. Control then switches to E-123 Omega, who appears to fulfill the "Shadow Support" mission he was tasked with over two hundred years ago by Rouge. Centuries without maintenance don't seem to have damaged the robot's weapons, and his gameplay is considerably more straightforward than Shadow's: simply jump up to Mephiles and shoot him repeatedly in the face with Omega Launcher.